A perfect gift for a proud big brother! He will love showing off his new status with a personalized Big Brother T-Shirt made especially for him. 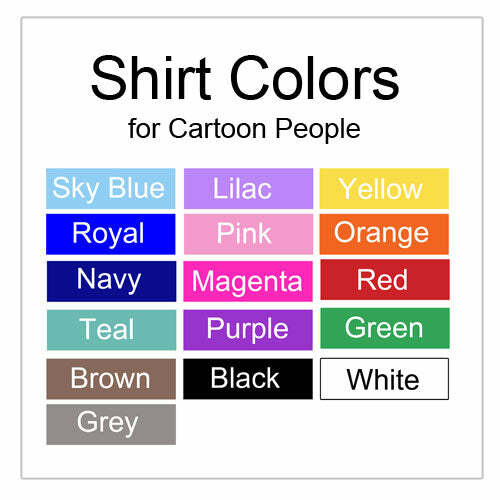 Select any of our cartoon kids (up to 4 max) with any skin or hair colors to resemble all the siblings and personalize your shirt with their names under each head. Customize the top with any heading, for example - "I'm the Big Brother", "I'm a Big Brother Again! ", "I'm the Biggest Brother", "I'm going to be a Big Brother! ", or "I'm the Big Brother of TWINS!" You can also order matching shirts for the little brother or sister, a Middle sibling, etc. See instructions on the order form on the right. If you would like to order matching shirts with the same design for additional sibings (Little brother or sister, Middle sibling, etc. ), you can do that without having to order each one separately. In the field below, enter the HEADING and SIZE for each additional shirt. For example, "I'm the Little Brother", 6 month romper". Then at the bottom before you add it to the cart, choose the total QUANTITY of shirts that you are ordering (for example 2) so that the site will charge you the right amount.